Turns out there is no internet, no phone connection deep inside the savannah of Zambia… We did not even have TV and, several times, no electricity for a day. It was kind of nice but also meant no contact with the rest of the world. So here is, finally, a new update. We flew from Lusaka to Mfuwe. We knew we would get picked up and taken to the safari lodge called Lion Camp, located inside the boundaries of South Luanga National Park. But, really, we had no idea what to expect. Outside the tiny terminal, a safari vehicle was waiting for us. A large jeep, extended with 3 benches that are higher than the driver’s seat. It was the standard 38º C or more. 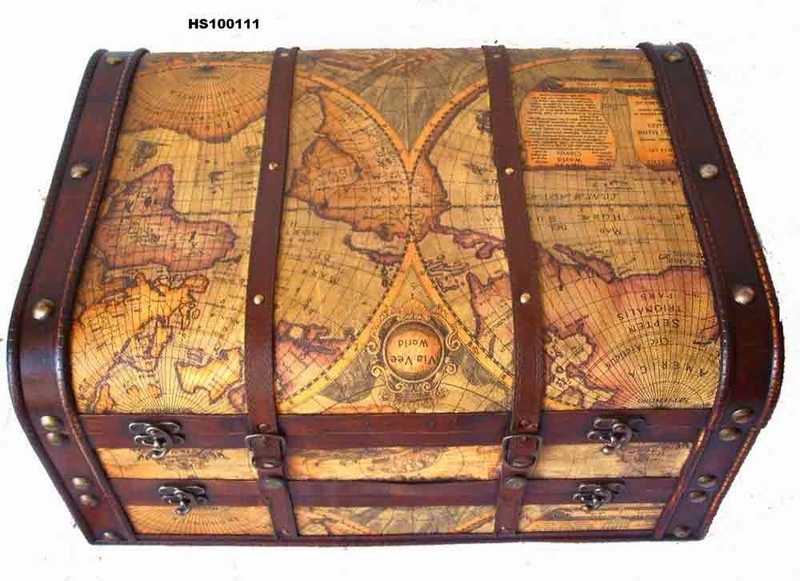 Our bags were loaded and we climbed onboard for the wind blown trip down the dusty red road. It turned out to be a 2 1/2 hour drive from the airport to the lodge. After 15 minutes or so we drove through the village of Mfuwe (Muh-FOO-way): clusters of straw huts and crooked wooden stalls. 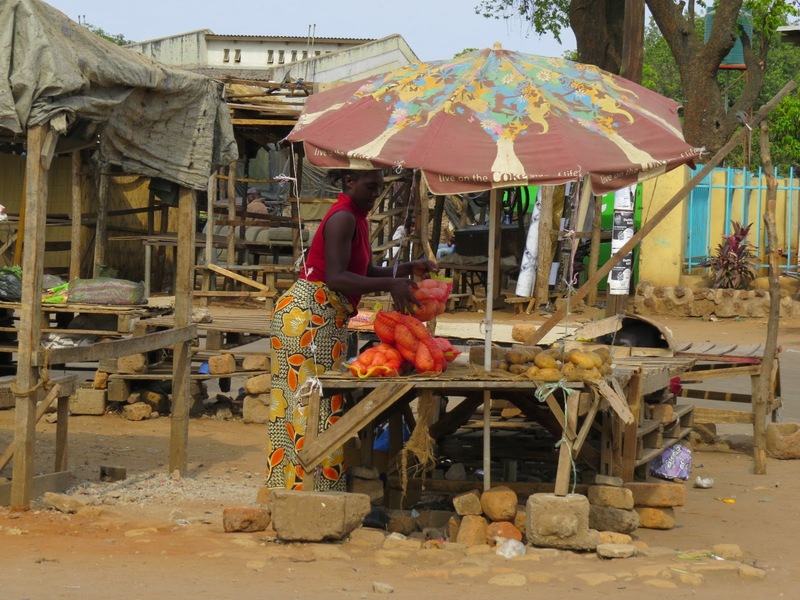 The poorest of poor people sitting in the shade of a few straggly trees – some selling tomatoes. Barefooted children waving at us. We noticed campfires for cooking, some brick ovens for baking. A rusty dangling sign announced a ‘beauty parlor’ or the Good Tidings Fish Store’. When we reach the entrance gate to South Luangwa National Park, we cross the long cement bridge over the Luangwa River. Almost immediately the drive from the airport turns into a game drive. Elephants lumbered on the sandy banks of the almost dried up river; a huge group of hippos is almost submerged in the river to escape the midday sun so they don’t get sunburned. To our amazement we spot a pride of eight lions sleeping under a tree. Giraffes stride through the bushes. Buffaloes with their large black judge’s wigs on their heads track to the river. 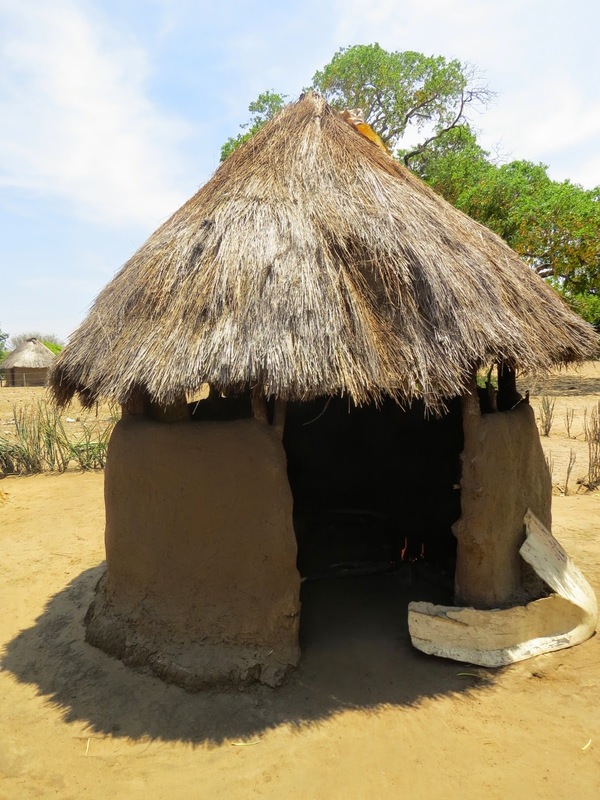 When we finally reach the lodge, it turns out to be a gorgeous large building that blends into the environment with a straw roof and mud coloured walls. One hostess greets us with wet towels, the other serves us a cold drink. What a welcome in this 4 star resort. Radiating out from the main lodge, are raised wooden walkways that lead to a small number of cottages. They are raised to separate us from the lions… Our chalet is the far one, the honeymoon suite. Never will I forget the moment that we opened the door. We looked across the kingsize bed, covered in a white mosquito net, and out of the two large screened walls. A wooden porch surrounded our room but the view was of the river bank: absolutely teeming with animals: a large herd of zebras, snorting hippos, a few giraffes and, to top it off, a small herd of elephants lumbered by – right outside our windows. It truly was a jaw dropping view. We had ten minutes to wash hands, put on more sunscreen, have a cup of tea and we were off again. This time on our first official safari drive. Our guide was Hendrix, a very nice and knowledgable wildlife guide. To our amazement our safari drives have been almost always for just the two of us. I had imagined, before we came here, that we would be with a car load of other tourists. But it is just the two of us and sometimes one other person. On the game drive, we see a large male lion devouring a piece of meat under a tree. Coming around a bend, there suddenly is a hyena showing its teeth at us. A large herd of elephants has little ones and is lazily browsing on leaves. The next morning we drive down the river bank, onto the white sand and find ourselves in the middle of a pride of 18 lions. Two little cubs are playing in the sun. Father Lion looks identical to the lion king, surveying his pride and his kingdom. Zebras abound. Hippos crowd the river so that it looks like you can walk across their backs to the other side. I have never seen such huge crocodiles, one staring up at me from below the river bank. We stop for a coffee/tea break on the morning drive, and for sundowners during the afternoon/evening drives. The first night we stop at the river bank, during a brilliant red sunset where tables with beer and champagne and chicken wings await us. For once, it is kind of nice to be spoiled in a 4 star hotel. In fact, the amount of wildlife we see in the first two days makes me realize that, if you are on a budget, it might be more economical to spend 2 days in a top notch resort with the best possible guide, then to spend 5 days in a cheaper place. We saw everything we could have wished for in those first two days. Dining is at 8 PM by candlelight. We spend the next few days in a cheaper lodge but still with elephants roaming outside our door and hippos snorting into the fading evening light. During the next few days we see a leopard: the first one has just killed an impala and hauled it into a tree. Then we spot one with two cubs. The fields are dotted with bush bucks, impala, waterbucks, kudu’s and more. I love the wart hogs who run with their tails straight up like a little flag pole. In the spot light at night we see mongoose, porcupine and curvets. 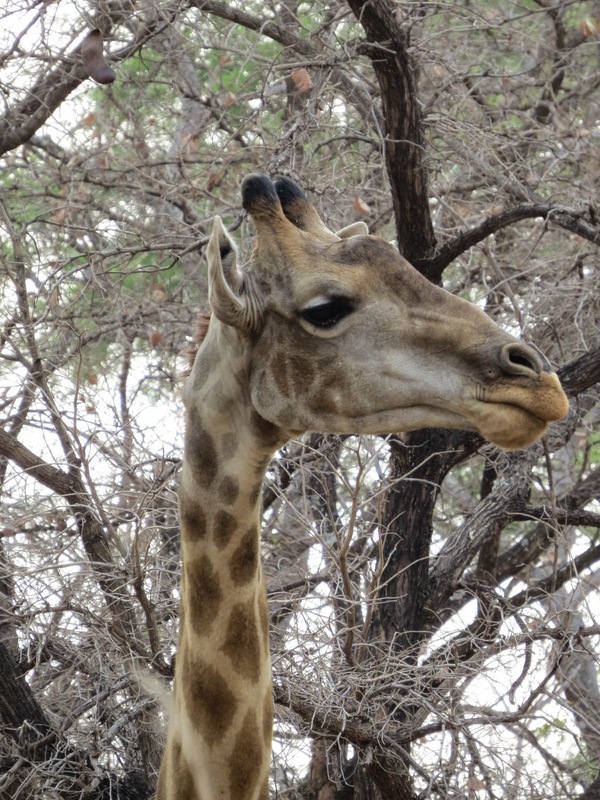 The array of animals is rounded out by endangered wild dogs, a hyena in the day time, lots of zebra and giraffes, birds of all shapes and sizes. It is survival of the fittest: on the first day we saw how wildlife officers tried to save 8 buffaloes who were stuck in the mud – it didn’t work because two days later we see their carcasses covered in vultures. Even a pride of satisfied lions had their fill of buffalo meat. 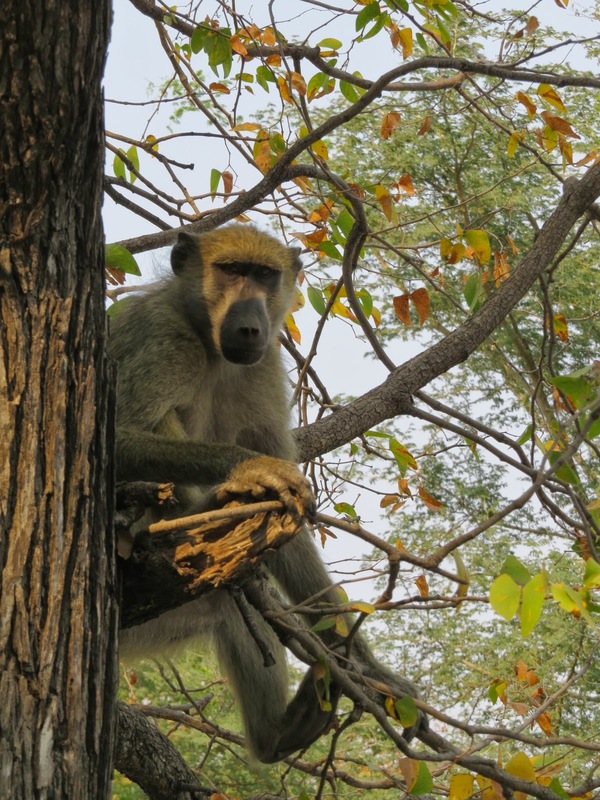 Of course I (Kees) was very interested to find out what it takes to become a wildlife guide/park ranger in Zambia. On the second day I find an operations manual for wild life guides, the same type I used to write for the park rangers in Kananaskis Provincial Park many years ago. It surprised me the amount of detail they had to learn about wildlife, laws, resource management, history, constellations, and much much more. There is no school for park ganger/guide, but they start as a scout, assisting the certified guides and over the years through self study they have to memorize the entire manual of 165 pages. 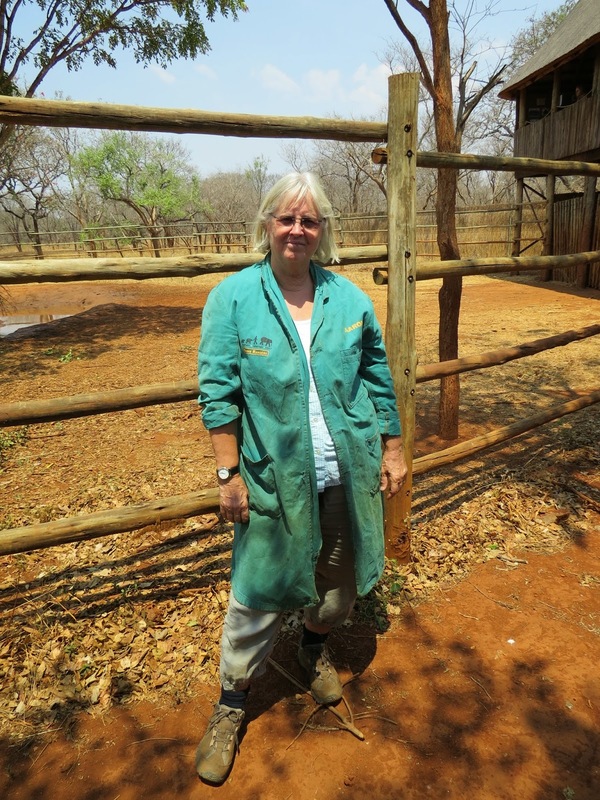 Then they have to sit for an oral and written exam and a practical exam in the field. That will provide them with the Guide I certificate and after a few years, of more study they can obtain the Guide II certificate which will allow them to conduct walking safaris. The guide also has to be a car mechanic.. When we were surrounded by lions I wondered if the truck would start again. It did. But once it did not… Just before, we had stopped next to a leopard and would not have been able to get out. When the truck died, there were no animals and the two of us pushed it downhill to start! One afternoon, we have lunch at Track & Trail River Camp. They’ve set a little table for us and when I look up I spot an elephant. Then three more. They come within meters. From the safety of the kitchen door we watch as they stroll passed, right next to the bar. The (ex)poacher has nine children and no job. 70% unemployment in Zambia means no work, no income. So how does a father provide for his family? How does he put food on the table? He got caught. At some point he got offered a job but screwed up and went back to poaching. He ended up in jail. Jail in Zambia is not for the faint of heart. “1,500 mean in one cell,” he says. People right next to him died of suffocation. One meal a day of a kind of uncooked porridge. It was a wonder that he survived the year. But now he swears he will never poach again. Only time will tell. We hope he will find a job. His skills as tracker are probably unparalleled. And he now seems to agree: wildlife needs to be protected. Wildlife brings tourists and tourists bring money. We also understand the problems caused by free roaming wildlife. Herds of elephants trample and eat the crops of corn. They brake into grain storage units. Governments try to help villagers by building stronger storage units. They supply villagers with ‘chili bombs’ and help them to plant chili hedges to discourage elephants. I think about this as I fall asleep to the music of cicadas and the loud ‘snoring’ of hippos just outside our chalet along the river. That night we have the very first rain fall of the new rainy season – the first rain in 7 or 8 months. It will soon transform the region into a lush green forest with wide rivers and newborn animals. We have spent the past few days at Lilayi Elephant Orphanage. I am here to do research for an upcoming book. 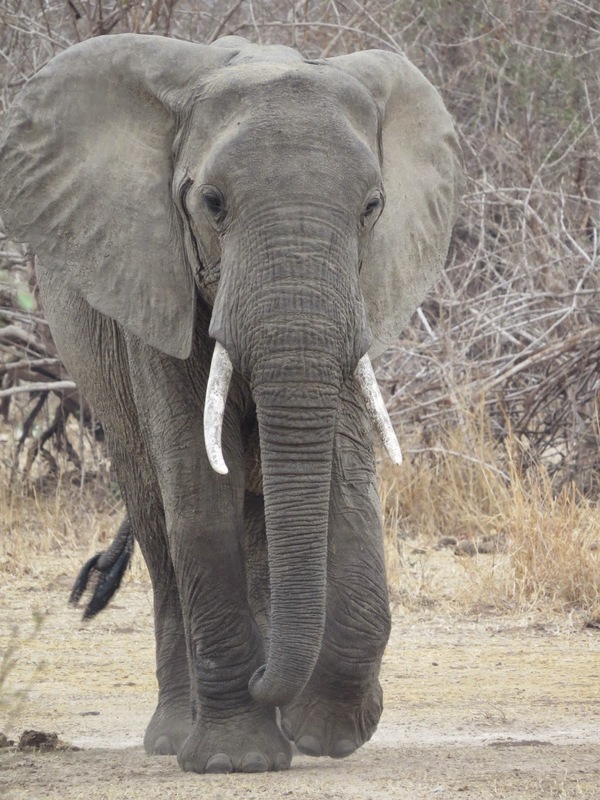 I kept pinching myself… After seeing the website so many times, after watching You Tube videos of elephant feedings, we are finally here – in real life and up close. It is heartwarming to see the small elephants frolicking, splashing in the mud, playing with each other and emptying their milk bottles in 10 seconds flat. 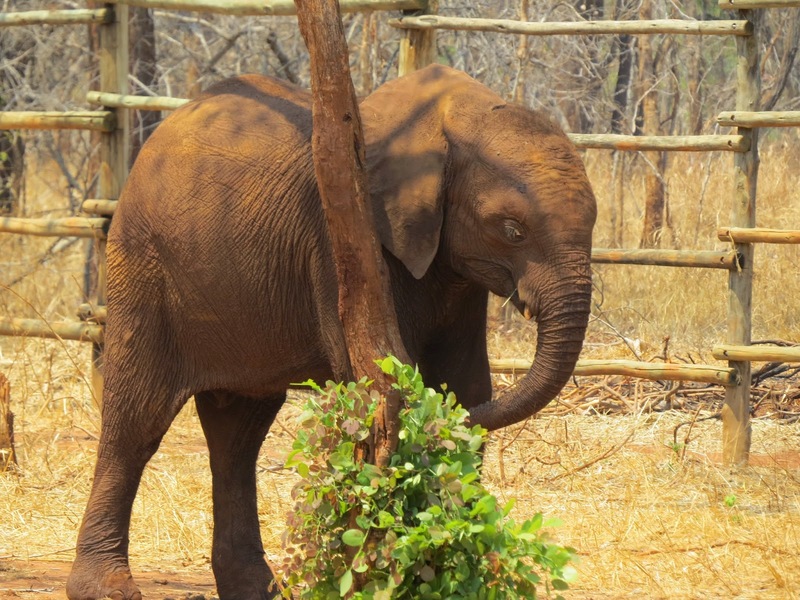 The volunteers and caretakers are all dedicated to giving the best possible care to these little orphans. 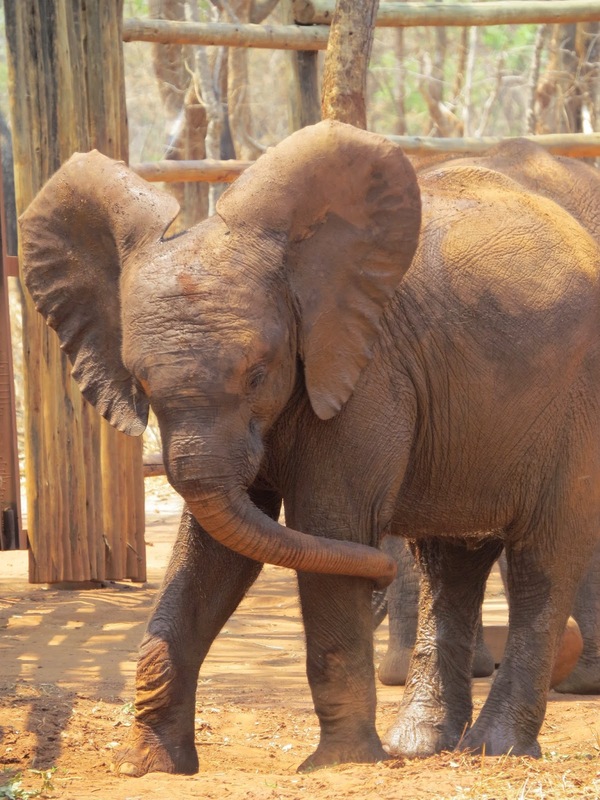 To all of my friends who made a donation for the elephant orphanage: THANK YOU! We now saw the impact any amount of money has. 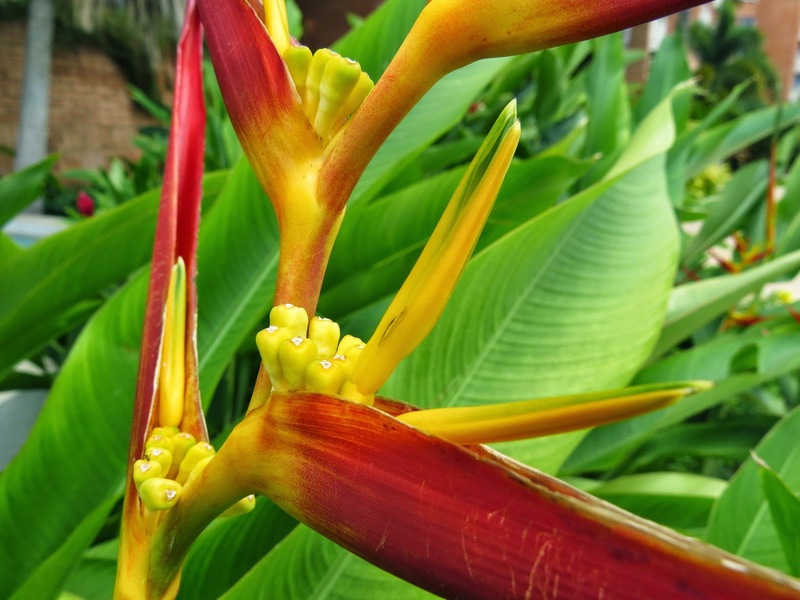 It enables feedings and care and better chances of survival. For three days in a row we visited the Elephant Orphanage and took lots of pictures for my future book. This is one of the main reasons why we came to Africa. Today we were lucky enough to be able to join the elephants for a forest walk. The trees are turning green in anticipation of the rain, which should come soon. Isn’t it amazing that the trees turn green BEFORE the rain comes?! 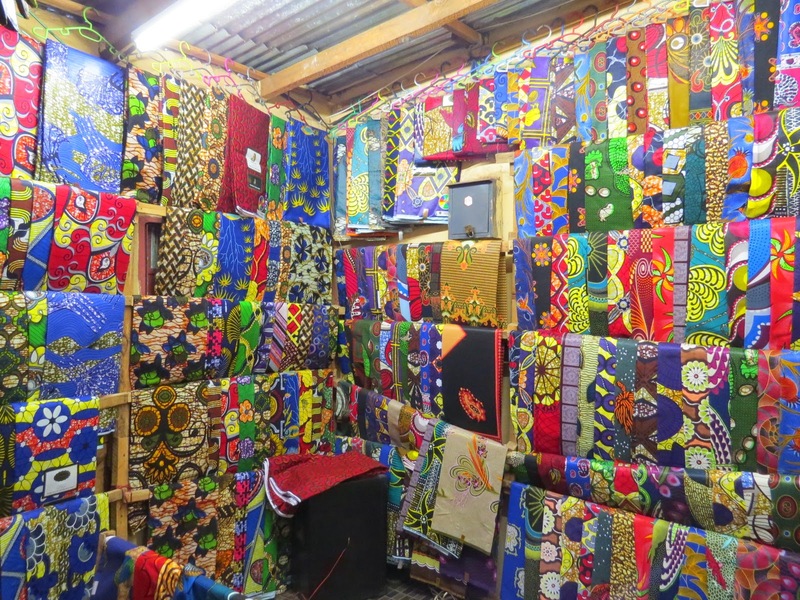 I also spent a lovely few hours at a craft market, just roaming around and drooling over African fabrics, quilts, bags, wood carving and jewelry. Love it. 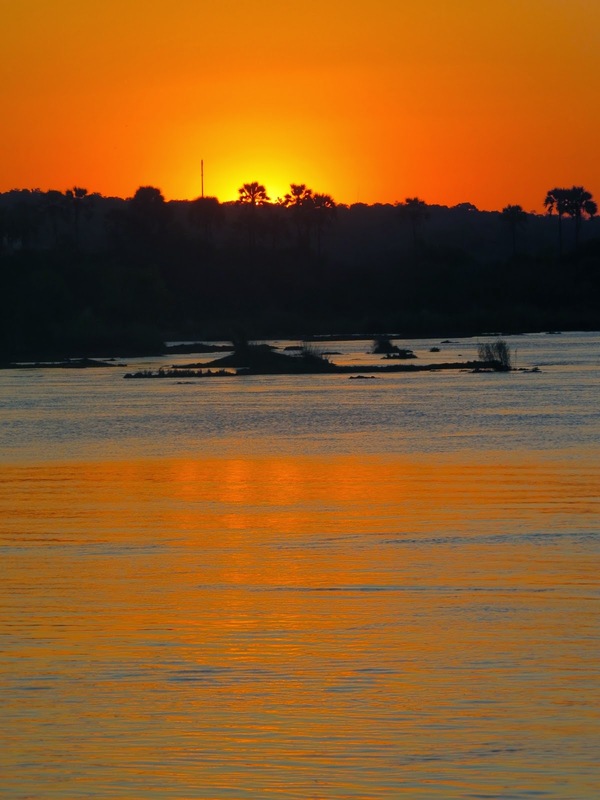 We took a taxi to a beautiful lodge along the Zambezi River to watch the sunset. We sat in lazy chairs on a wooden patio, right at the water’s edge. Hippos frolick in the water, blowing air and splashing at each other. And, to our delight, we spot zebras! A whole herd. One even has a baby. And then… giraffes! Real, wild giraffes. First there’s only one. Its thick long legs look exactly like the tree trunks surrounding it. You can only spot him when he moves. Then three more giraffes appear. They lazily munch on leaves, stretch higher for more green and then spread their long legs wide to reach down to the grass. As the sun slowly sets, and the zebras graze behind us, while the hippos snort in the Zambezi, Kees and I grin at each other: we are finally in Africa! A few days later we have flown back to Lusaka and, just outside the city, we see more zebras and giraffes. But we also spot our first hartebeest, impalas, vervet monkeys and warthog! What a thrill to see these African animals in the wild! Early in the morning the book bus drives us an hour out of town, off the main road and onto a bumpy dirt road. The road winds through a tiny village of straw huts. Women squat by fires, babies tied to their back. Spindly children run and play with a string and a piece of metal tied to it. At one hut I see men butchering a pig. Chickens scratch the red dust. The road gets narrower. More huts. Each time I think we’ve reached the village where the school is, we keep going further into the bush, across dusty land. I read my Emma book and every mouth drops open when my Emma chicken puppet moves her head. They giggle and touch carefully. We make paper chickens and do more songs, read books and make crafts. For some, it is the first time they use scissors. One girl tries, mouth open, for ages to cut a little strip of paper. Another boy cuts flawlessly along the black lines, ever so careful not to miss a bit. Then a lady comes from the village to give us a tour. Her name is Janice. She is a grandmother, a volunteer teacher at the preschool and a guide for any visitor to her village. “We are grateful to your clan,” she says, explaining that all western visitors are the clan who have made this school possible. “Our children learn, and have a future now,” she says. We walk for a long time into the bush along a narrow, dusty trail, until we reach the first straw hut. No stone or cement buildings anywhere. No cars. Just straw huts in the bush and people walking barefooted everywhere. A few children are not in school. Their parents haven’t paid what it takes to get a uniform and shoes, about 3 dollars. Women sweep, carry babies and water, they make fires for cooking and haul water. The village is lucky. A Japanese NGO built a water pump, solar powered, that brings water to the surface and stores it in giant tanks. They come to fill a container and carry it back on their heads. I can barely lift one of the containers with my hand, let alone carry it on my head. We meet a young girl with two little siblings. 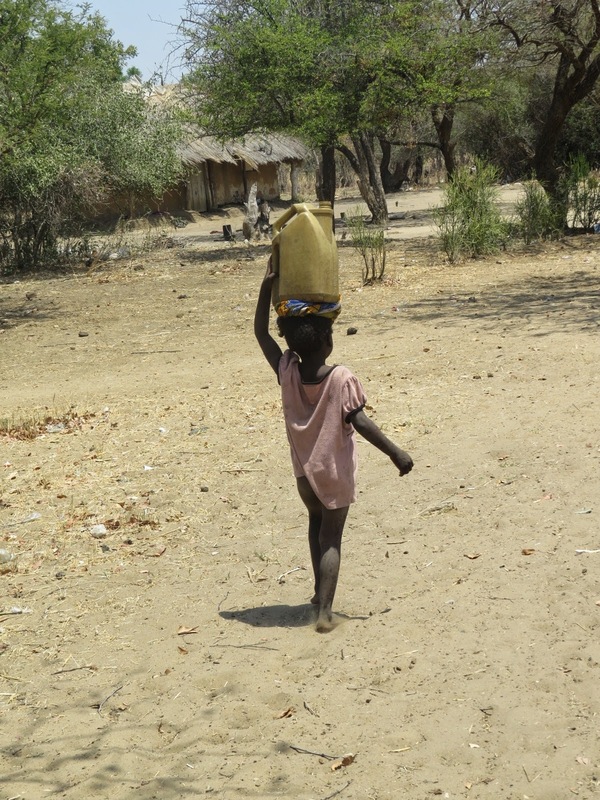 She carries a 40 L container on her head and a 15 L jug in her hand. The maybe 5 year old carries a large container too and even the toddler, maybe 2 or 3, has a jug on his head. We offer some help and carry the containers part of the way. They are on the way to their grandfather’s house, they explain, to bring him water. But the toddler doesn’t want help. He wants to do it all by himself. Janice shows us inside the yards of some huts. A woman hangs laundry, scrubs in a tub. Another makes a fire to cook maize. Chickens have wire and branch houses and laying nests. We visit the pub, where Kees bravely tastes the local brown beer, a foul looking muddy drink. The homes are either straw or mud huts. The mud huts have a frame of branches with chicken wire stretched between. The wire is filled up with rocks and then plastered with mud. The houses have the odd wooden bench but mostly people sit and sleep on the mud floor. I have seldom, if ever, seen such poverty. One house has a bathroom: outside in the yard are three ‘walls’ of tall grass sheafs and a piece of metal as a door. Inside a wooden bench where you can place a bowl to wash yourself. 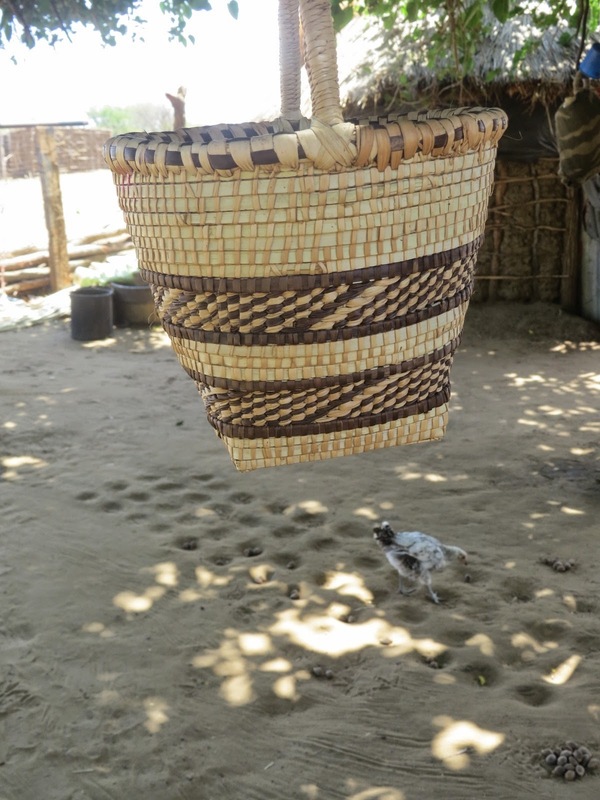 We chat with the village head man who lounges in an old lawn chair and makes wicker baskets for a living. His daughter looks after him, cleaning and cooking and caring for house and livestock. 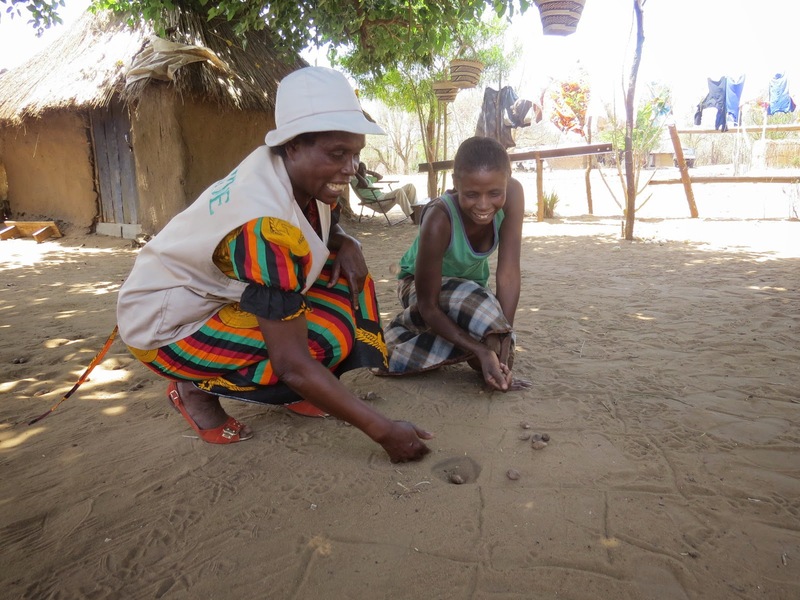 She shows us a game: indentations in the dirt with beans that need to be picked up and moved. I show her how we play hop-scotch and marbles. We laugh and laugh. We hope it really waits a few more weeks. I cannot imagine living here when the rains come. Everything will be mud. Roads and houses flood, and all roads will turn into thick sticky red mud. But the rain also brings food. Open areas in the bush have been burned in preparation for the planting of corn. They will plant corn soon. It will provide flour, the basic staple for the coming year. But elephants are a huge threat. They will be attracted by the fresh green plants and don;t know that they destroy the people’s annual crop when they trample and munch the corn stalks. How do you solve such a problem? The elephants are protected and can’t be shot. But how do the people protect their life line? It is a baffling problem that many villages here face. 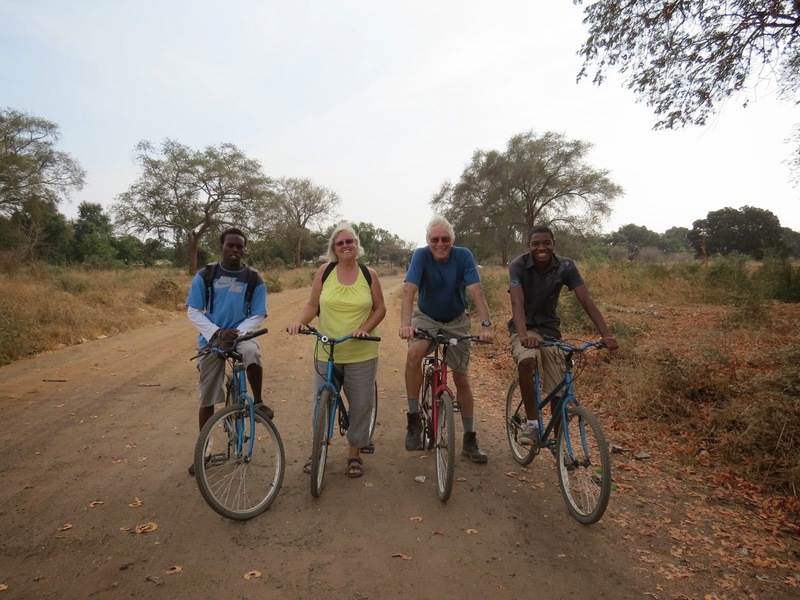 Getting up early, we left the compound at 7 AM with two local young men, each of us on a bicycle. What a great way to see the city and surrounding area. These young men are part of a job training school, with the income going to the school and the students learning different trades, like being a guide. We cycled through one part of town, then across the railroad tracks to another. 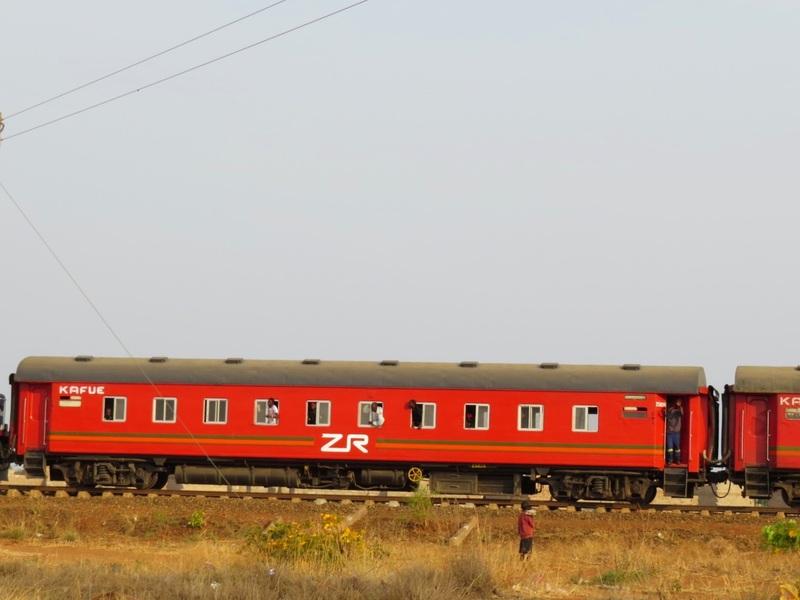 Even saw a train from Lusaka chugging along, people leaning out of the glass-less windows. Trash blowing everywhere. 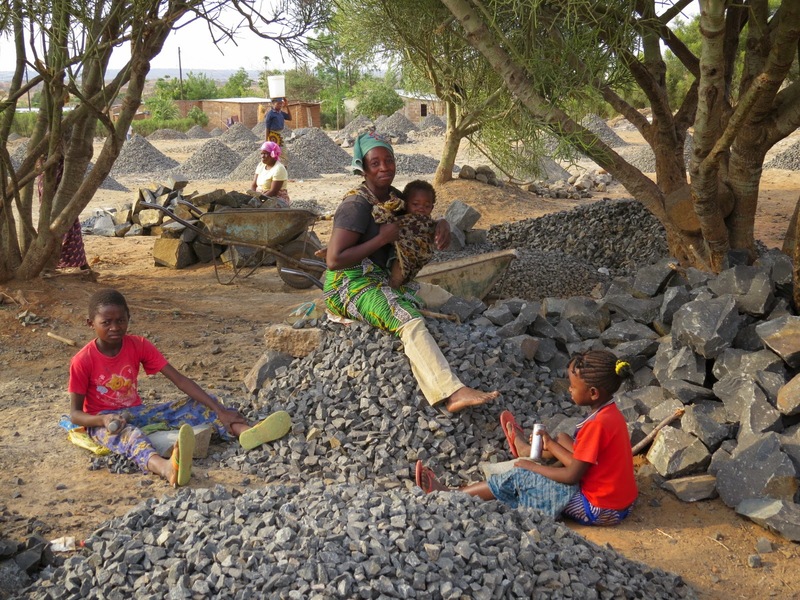 The two guides took us to see the local rock quarry where people work all day long, in the blazing heat, to pound rocks into gravel. 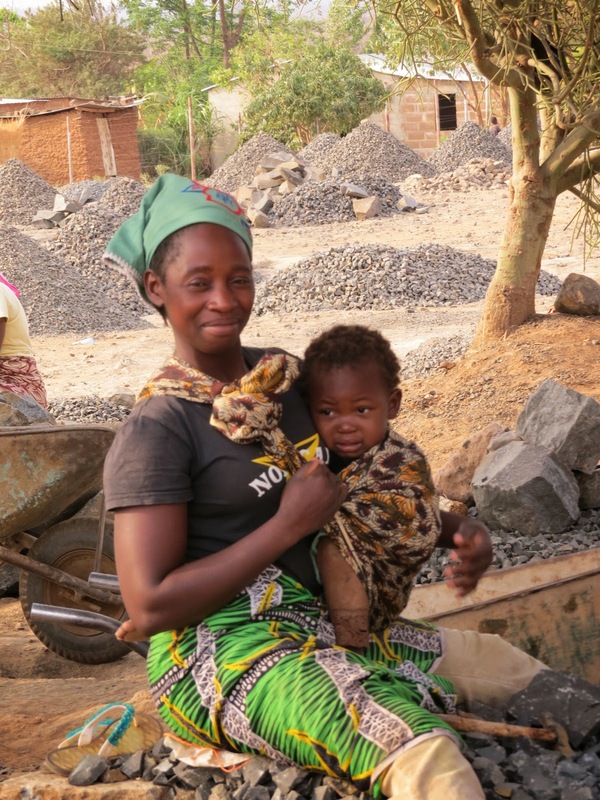 Small children sit in the dirt, helping their mothers. A mother might have a two year old strapped to her back while pounding, and more children around her, all working away. For a wheelbarrow full of gravel that might get one dollar, if anyone needs gravel that day. Young boys haul the large rocks out of the pit and throw them up on top. Heavy, terrible work. But it is work and makes an income of sorts, with which they can buy corn and other food. We saw one boor hole in the area where people came with jugs of all sizes to collect water. We cycled on along dirt roads lined with tiny houses and rackety shops. Crossed over a railroad bridge and went to a market. Many stalls offered fish, fresh or dried, spices, fruits and all sorts of other wares. Others offered used clothing and shoes. It is amazing to see how clean people are, often wearing white clothing. I feel dusty and grubby much of the time. Children came running, calling “Hello!” and waving. “Mzungu!” we kept hearing, going from child to child, “White people are coming!” And the kids would run up, wide grins on their faces, waving as hard as they could. I chatted with mothers and grandmothers, everyone with beautiful smiles. We were home just when the temperatures got too high for cycling. A cold coke never tasted so good. Is the Book Bus for you? Voluntourism is huge around the world. It is so much more meaningful to spend your holidays helping others, than to just fly somewhere and lie on the beach, right? 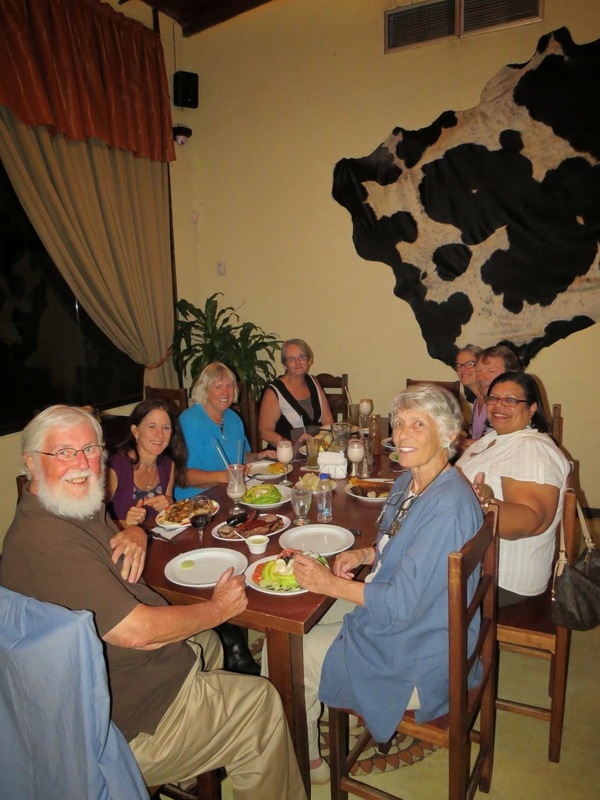 But volunteering abroad can be very expensive, even when you know that part of your costs will help others. 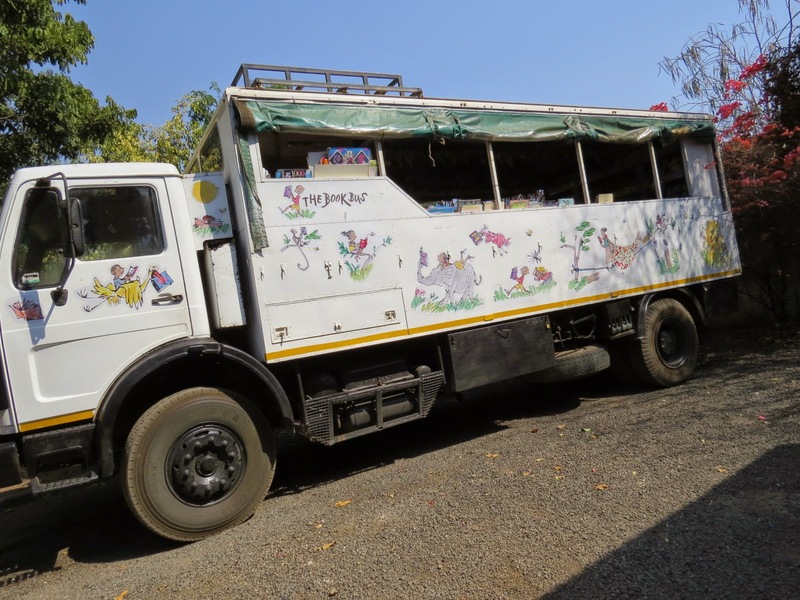 The Zambia Book Bus’s office is based in the UK and has one person running and coordinating the bus in Livingstone. She has been here for 6 years and done an amazing job. Everyone respects her: the local people all know her, the children everywhere come running and calling “Kelly! Kelly!” The police, the store people, taxi drivers, everyone seems to know her and love her. 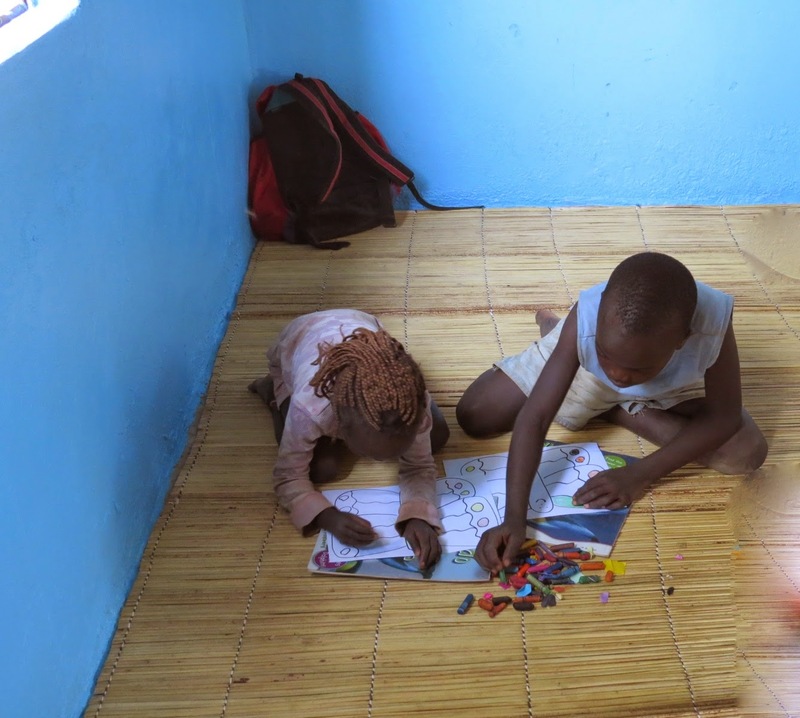 Can you imagine living in a tent for 6 years with nothing but a few clothes and the strong determination to make life a little happier for many children, to help them realize the joy of books and wanting to learn? The Book Bus visits Livingstone area schools. 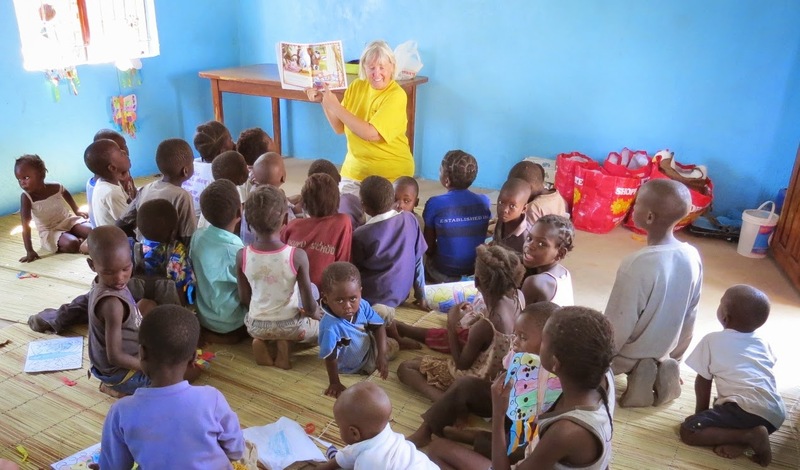 Kelly and the volunteer team read books to the children and conduct activities based on the books. For instance, today I read two African animal tales to them and then they drew an animal and decorated it. We also made book journals so that they can keep track of the books they read. Even though I have spent most of my life in children’s literature, and done 12 years of weekly story time in a library, it’s the little things here that blow me away. The kids have no frame of reference for books about so many concepts. Of course, books are meant to be a window on the world and will teach them new things. But how can you relate to a pet fish when you live in Africa? Why would people paint eggs? Or keep a dog inside a house? These kids have no electricity or running water. Many people live in their small home or hut and struggle for a daily living. Books about food? Can’t use them… the kids are hungry. Even Dr. Seuss’ “You have feet in your shoes…” doesn’t fly here for many children. In order to hand out coloring sheets, following the story, we (the current 4 staff members) sit and draw (or trace) 100 pictures of butterflies. No photocopier here! The Book Bus accommodations are primitive. When we first arrived I was quite amazed at just how primitive. We sleep in a regular tent – no wooden floor, no veranda. Just a plain tent with, some broken, zippers in the red dust. There’s a kind of gazebo with a large picnic table where we spend most of the evening. It has a light. We cook outside on another picnic table. Dishes are stored in plastic bins. There is a fridge and a kettle and a power bar to charge our batteries. After only 3 days in Zambia, I realize that I now find this place quite luxurious. There’s a pool with cold, refreshing water. A dusty bathroom block has toilets and showers with, sometimes, warm water. After working hard all day, Kelly cooks a pot of food for all of us and we do the dishes. If you want luxury, don’t come. But do come if you don’t mind camping in the heat, without air conditioning, it’s an interesting place. The Book Bus is based by a house with a kind-of-campground. It is shady, sheltered and safe. It is 20 minute walk into town to the supermarket, which has most things you could wish for. And your cost to participate includes all meals. You can hand wash your clothes in a large old bathtub outside, and laundry hung on the wires is dry within two hours. We only work mornings, leaving around 8:30 and returning by 1 or 2 PM. (called 13 or 14 hours in Zambia). The book bus takes us to a different school each day where we read stories to and with the children, followed by activities. Their school has no paper or glue or scissors. Even adults ask shyly if they can make an elephant mask or color a picture… In some places, the book bus attracts 300 children! On Monday we drove out of town to a village school along the main road. A large group of children, grades 2 and 3, were overjoyed to see us. “Book-a-bussie!” they call. We read stories. 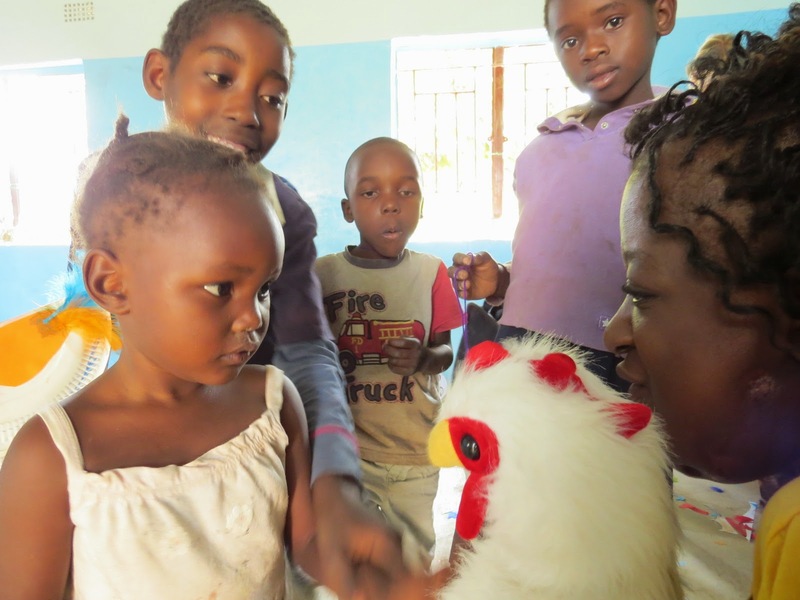 They all love Emma and nearly fall over when she moves… Then we color paper chickens and make butterflies. “Teacha, teacha!” they call, wanting crayons or showing their work. When we came ‘home’ with the book bus, we turned one large sheet of hardboard into a chalkboard by painting it with blackboard paint. And two large squares of soft board were turned into brightly painted bulletin boards. Kelly has worked hard to realize new schools and classrooms. And now she helps with getting desks and turning these spaces into bright, happy classrooms. She’s helped young women to became assertive teachers and children to want to learn how to read. If you live in The Netherlands, check out Mambulu Safaris: http://www.mambulu.com They are the Book Bus’ official rep in Holland and planned our entire Africa trip for us. A long flight via Dubai to Lusaka. There, a nice young man from the travel company welcomed us, took our passports and money and disappeared. But soon he reappeared with visas and ushered us ahead of the line-up. Picked up our bags in the hall full of busy African people and white visitors with suitcases. Then we re-checked them, changed some US dollars to Zambian kwachas and waited for our next flight. 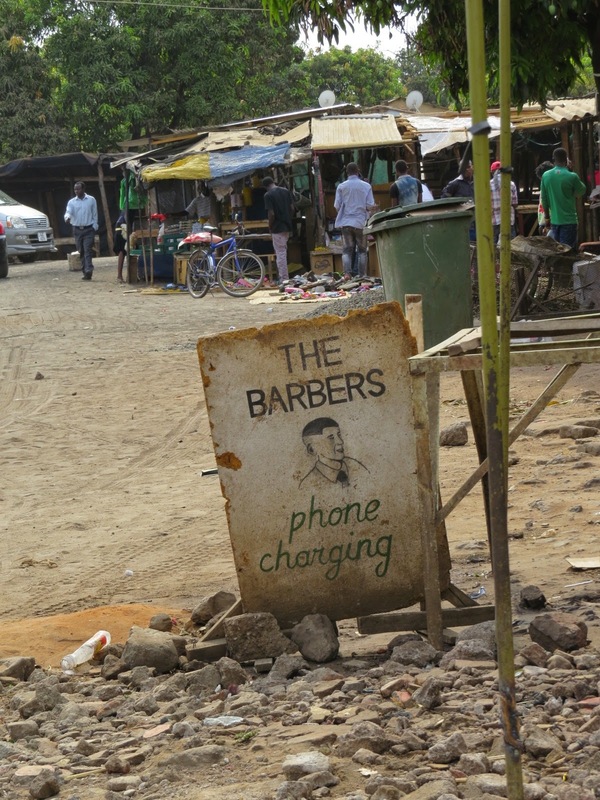 Walking over the hot tarmac, seeing red dust and corrugated tin roofs – we knew we had arrived in Africa. Finally. When Kees and I first dated, many many years ago, he had a map of Africa on the wall and we dreamed of the places we would visit and explore. It took so long to make this dream reality. Our next flight takes us from Lusaka to Livingstone in the south western corner of Zambia. We are basically on the border with Zimbabwe. Livingstone is a small city. We are here to work as volunteers with The Book Bus (www.bookbus.org) staying in a compound with a large house and a primitive swimming pool – but it’s great for cooling down on a hot day. We slept in a tent – a regular large tent. It’s all very dusty and dry. We eat at a picnic table under a stone roof and cook meals outside at the picnic table. Livingstone isn’t very big. Today we drove down the main road. 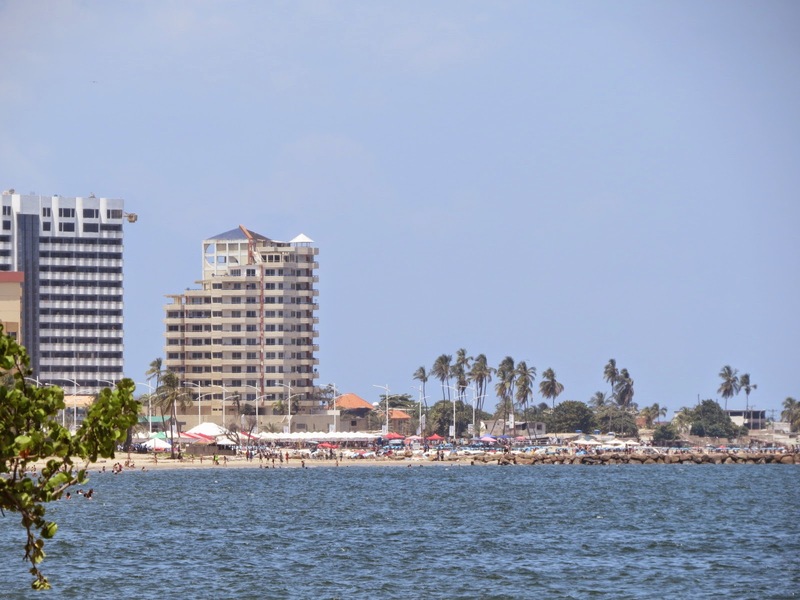 It has all sorts of shops – shoe stores, banks, phone shops, supermarkets. But just a few blocks away, people live in small houses and don’t have cars. They have no money to shop here. There are markets in other parts of town. If you can’t buy a large bag of sugar, you buy a tiny bag. So the stall owners measure sugar and flour and spices in bags of all sizes. There is 70% unemployment here so many people just walking around on the streets. The women wear long colorful skirts, often with a matching headband. On top of their heads they carry their wares: huge bins of carrots or a crate of 24 bottles of soft drinks, a 2 meter long metal tube or a mattress. It’s amazing to see the things they carry on their heads. Babies are tied to the mothers’ backs in a colorful cotton shawl. They just lay the baby on their back, bend over, wrap the cloth around the baby and tie it at the shoulder. I’d be scared to drop the child but when they stand up – the child is securely strapped to their back. We walked across the local market as the only white people there. 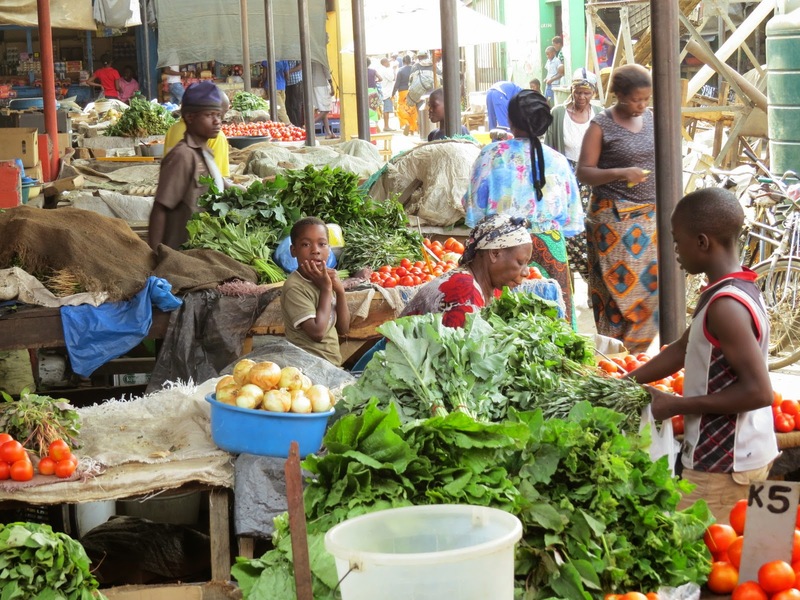 You can buy used shoes or plastic buckets, dried fish, corn, tires, everything at the market. We bought glorious African cotton and a long dress for me. Volunteering with The Book Bus, a UK based charity, is an incredible experience. Its success relies heavily on the one young woman who runs it here. Kelly is multi talented and accepted and loved by many Zambians. After six years here, she even speaks the local language. She capably runs the book bus. It is a huge old Safari vehicle with seats and open sides. The back and side walls have book shelves along the lengths. Together with volunteers who come from around the world, she visits local schools and community centers to introduce reading and books to the children. 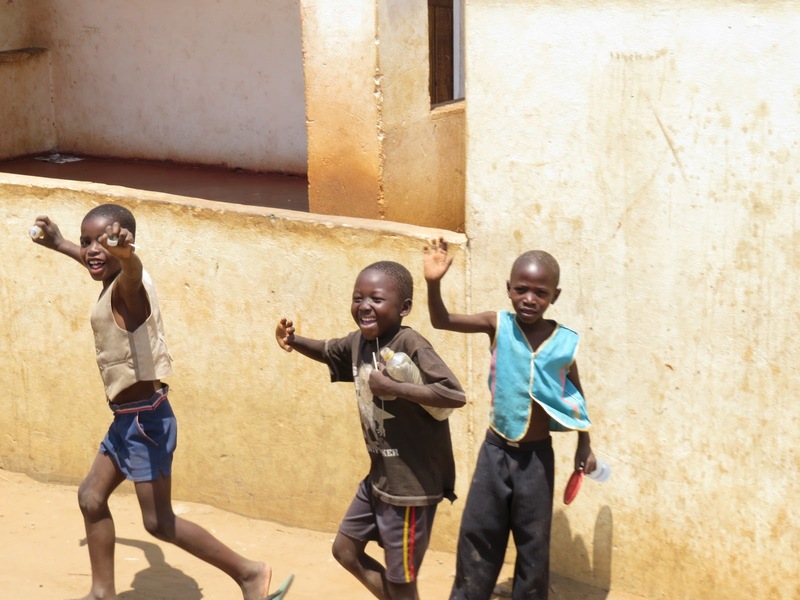 As soon as they spot the bus, the children come running with huge grins on their faces. Without any shyness, they come up to us and cuddle up for a book. 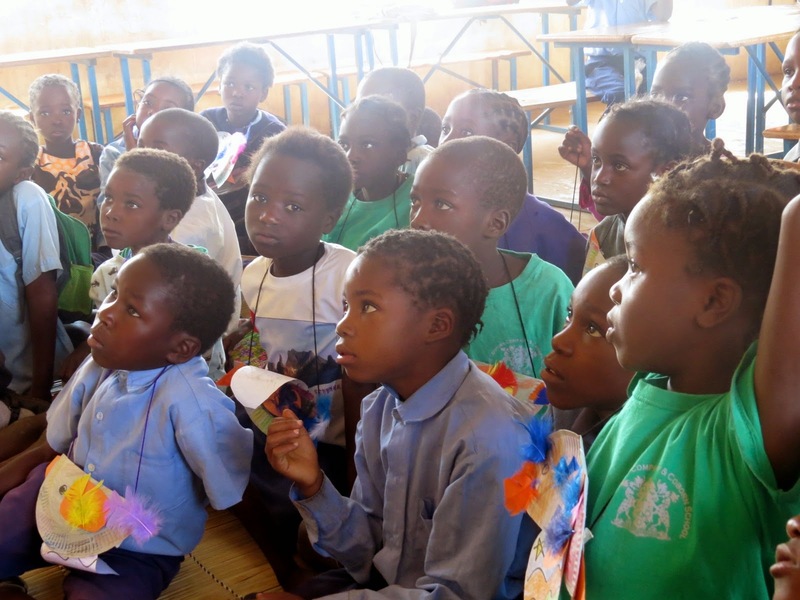 The older children are learning to read, all at different stages of their lives depending on how long they have been at school. They read along to learn the words. You can tell that they are used to chanting along with a teacher. Even the older students are very, very keen on any activity. A 14 year old sat quietly coloring – an activity that Kindergartens in North America might do. Her name is Abigail Nakawala and she is in Grade 5. She just started school last year and used to stay at home helping her parents. When she started school she couldn’t even write her name. Abigail was asked what she thinks of the library. 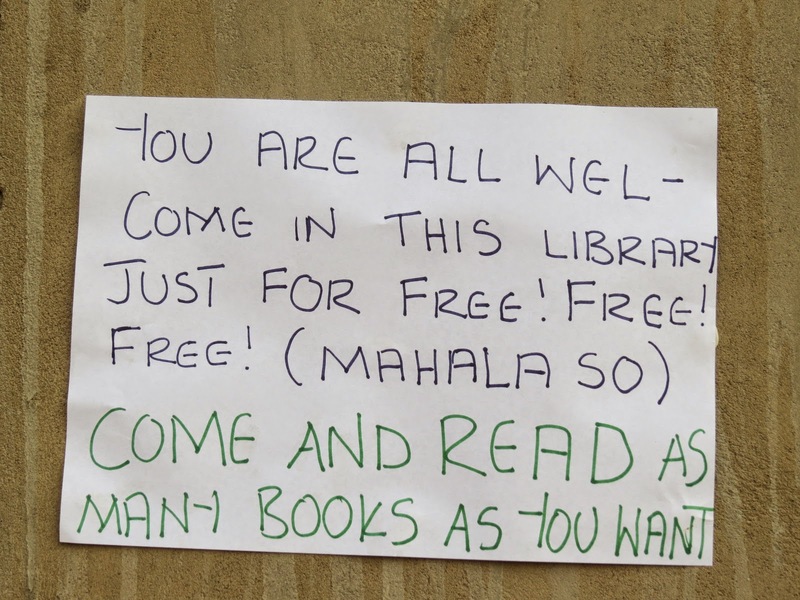 She says “It is a great place because even if you can’t read, it makes it attractive and makes you want to read. Her favourite book: is Tarzan, because “Tarzan has a good heart and he helps people”. The story helps her learn how to help people. When she finishes reading Tarzan she will get to know another book so she can learn a lot. 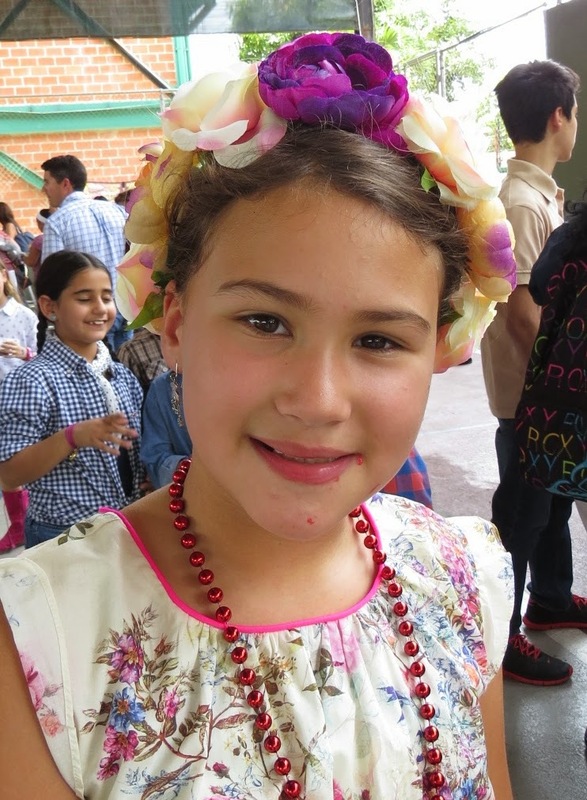 Abigail wants to be a teacher because she wants to help others learn what she is learning at school. She doesn’t want anyone to miss what she has missed before. A very funny story about the book: Kelly took the bus and parked it somewhere. She closed the canvas walls but when she came back, the taxi drivers all called “Kelly! There are baboons on the book bus!” Seven baboons had broken in and stolen bottles of Fanta…. 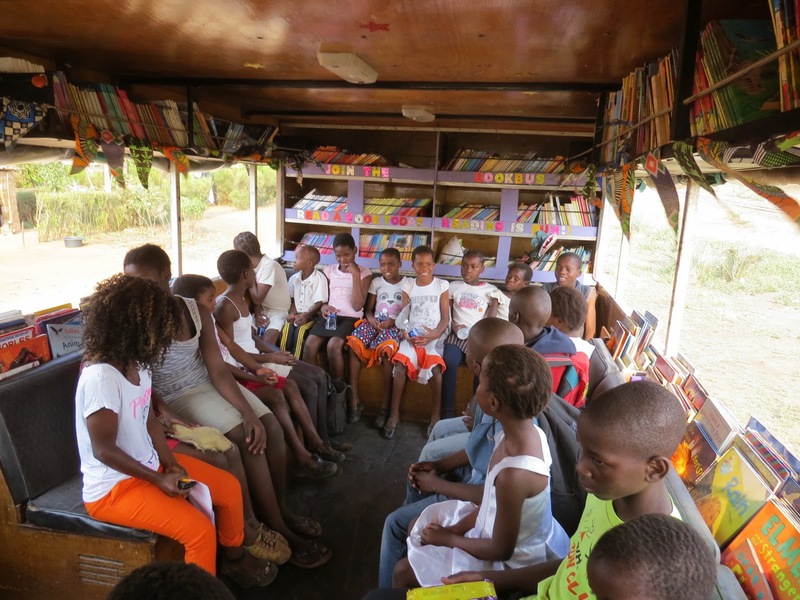 When we arrive with the Book Bus, children come running from everywhere – alleys and homes – they all run and follow the book bus to the community centre, which is a small 3 room hut made of plastered walls and a corrugated tin roof. Red dust flies everywhere. Kelly recently had a new classroom added – beautiful painted in bright blue. She even had someone pay for new desks. The children were so excited to have desks to sit in, they stayed and waited all day, refusing to go home before the desks arrived. I read my book Emma and introduced them to my chicken puppet. Their eyes popped out when they saw Emma moving. When an African child smiles, it is like the sun breaks through – brilliant and shiny. Then we read a butterfly story, did some counting songs and made paper butterflies. You can tell that a visit from the book bus, is the highlight of the day for these children. Today we picked up 25 children at the community centre, in the Book Bus and took them on a field trip of their lifetime. 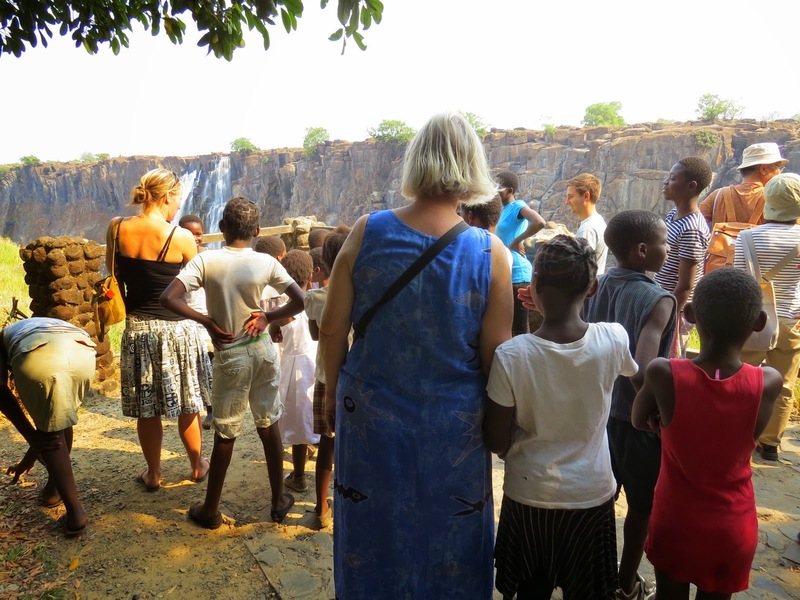 These children live 10 KM from Victoria Falls but most have never seen it.At the city center there are cars and concrete buildings. But the further you go away from the center, the fewer cars you see and the houses make way for huts. Some places seem to hang together of poles and pieces of plastic. Garbage bags make roofs. Feed bags make walls. Everything is red dust and even this gets swept in the morning. The houses don’t have any running water. The children who live here have probably never been to the city center, a 20 minute walk away. As the bus reached the pavement of the main road, a cheer went up. Many had never been that far from home or ever left their area. They had showed up in their Sunday best clothes and in shoes. None of the other children wore shoes so this was a special occasion. However, as Kelly told us, the choices here are to buy either used clothes from Europe (which are shipped here as donated clothes from African children, but they have to buy them), or Chinese stuff which doesn’t last long. Most kids have used things, and I don’t think I saw one pair of whole shoes. A teacher wore two different kind of flip-flops; one kid had a broken flipflop which had been fixed with wire underneath but kept breaking. Some kids walked all day on shoes that didn’t fit and came off with every step… But they were clean, and proud. They sang loudly and grinned as they received a bottle of water and a package of biscuits. When we reached the Fall (our non-resident entrance ticket cost more than all of the local children combined!) we walked down the path to see different parts of the falls. Not much water in it this time of year. During the rainy season the Falls are over 1.5 KM wide and thundering. 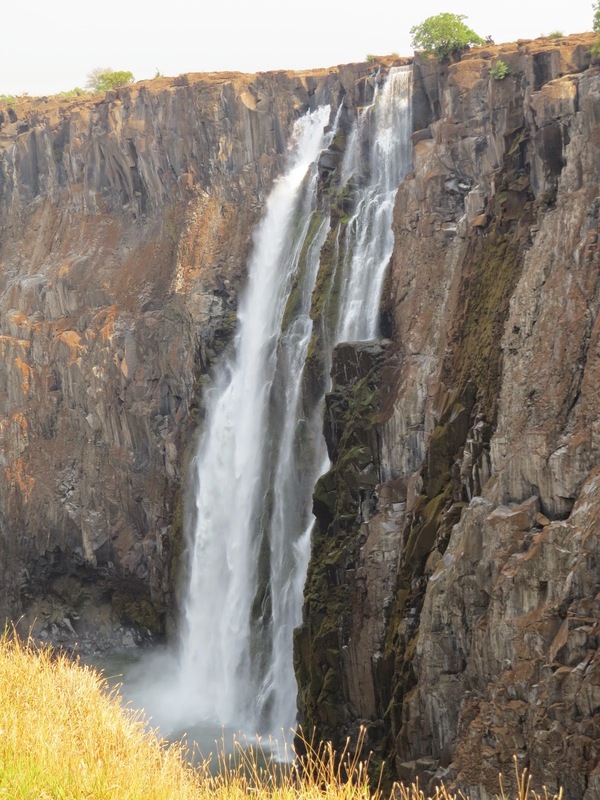 Their Zambian name is much nicer than ‘Victoria’ falls: Mosi-oa-Tunya meaning thundering clouds. But even now there were impressive parts, with rainbows in the spray and green puddles at the deep, deep bottom. The children clung to our hands, sometimes I had three kids hanging on to my arms because they were scared of the heights. They were so excited. If Kelly said “wait here,” they waited. No one ever misbehaved or strayed too far. 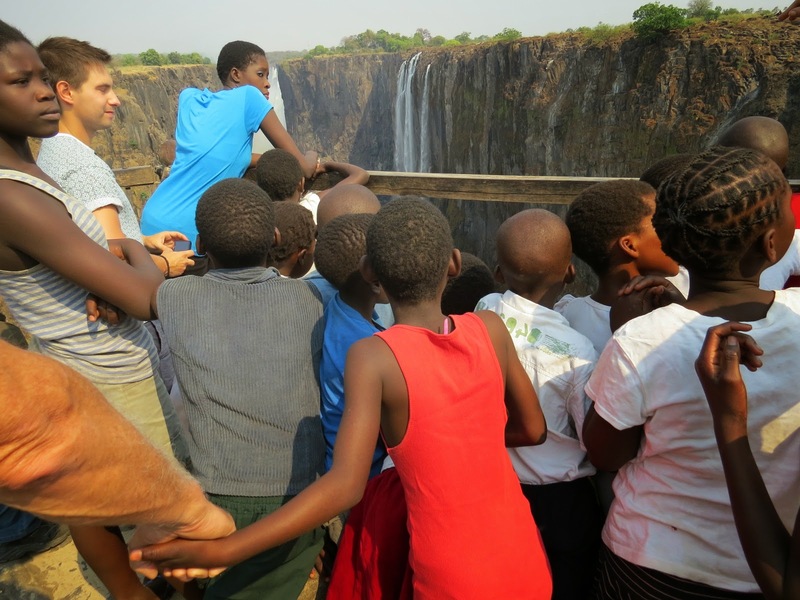 They marveled at the Falls and loved walking across the bridge into Zimbabwe. We yelled “Goodbye Zambia, hello Zimbabwe!” as we crossed the dividing line and back. 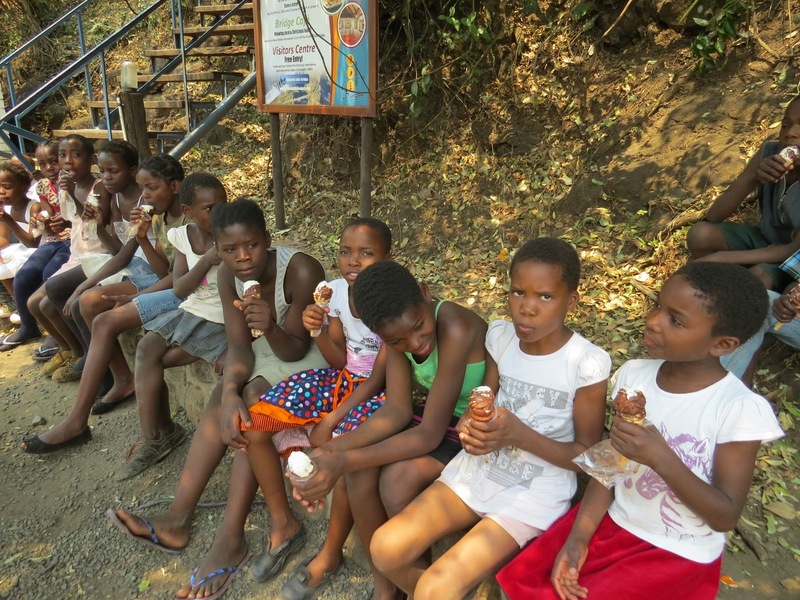 Then we ate ice cream, a rare treat for these kids. But the highlight of the day was when we found a clear pool of river water, left behind from when the river is higher. With a sandy bottom it made a perfect splashing pool. At first they cautiously tiptoed in the cool water, splashing their hands and faces. But when Kelly said it was OK, they stripped off their shirts and dove in – many with clothes and all. 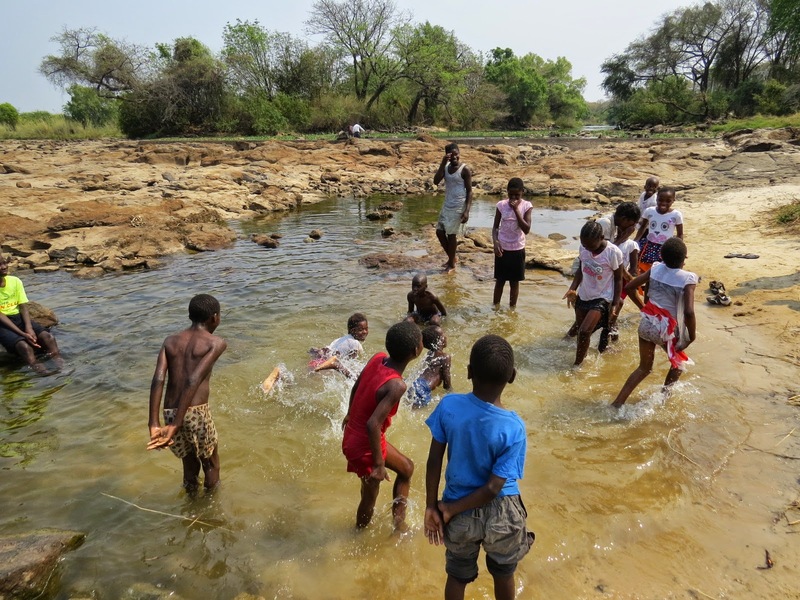 These children have no running water at home and to see them enjoy this pool was pure joy. With huge wide grins on their faces, they jumped and thrashed and rolled in the water. We wrung out shirts and they flapped dry in the wind as we walked on. 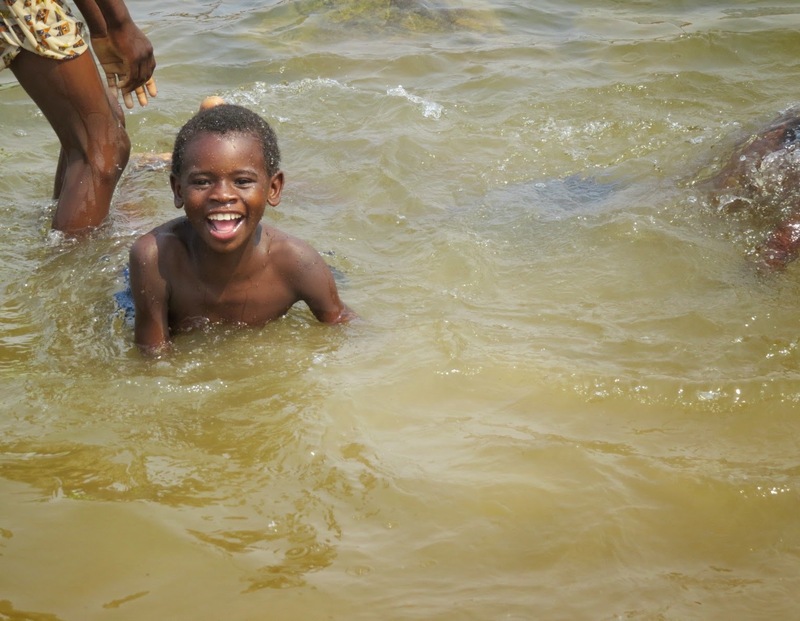 To see these kids frolic in the water is something I won’t easily forget: it was happiness personified. 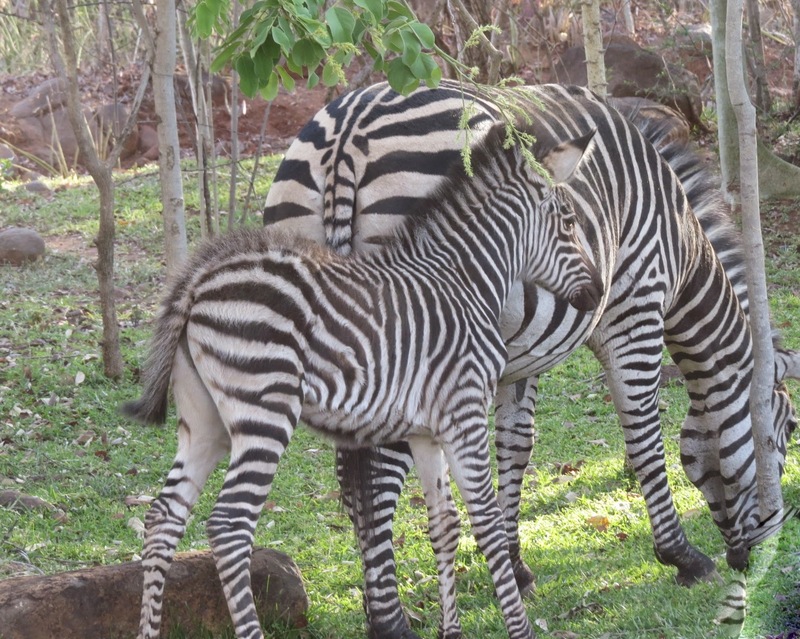 When we arrived, the kids spotted a zebra and apparently a giraffe – I didn’t see the giraffe. But there were tons of baboons, many with babies. And, knowing they might steal things from the bus, we lashed it securely closed before we left. But even so, with one of us still on the bus, one baboon snuck in quietly behind us and took off with a bag full of biscuits… the monkey! The kids thought it was hilarious. When we get back, they climb off the bus hugging close the water bottle and biscuits we gave them. Most kids didn’t eat them. Take bring them home to share with their family. I have been falling down on the job I guess, because my last blog was from 175 km ago: the day after I left Leon. I am now in Sarria, only 110 km to go to Santiago. 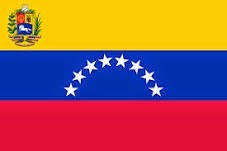 I am waiting here for Margriet who is teaching in Venezuela and should be here in about 5 days or so. 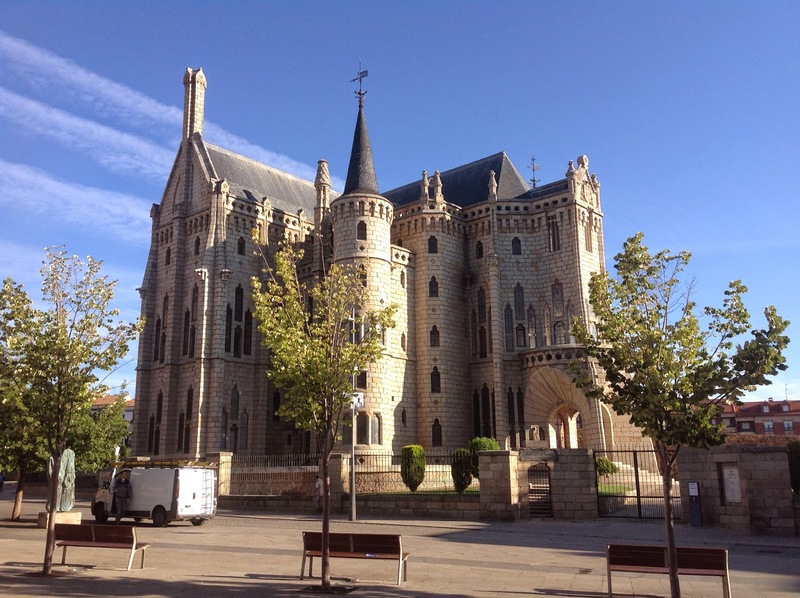 Two days out of Leon I arrived in Astorga, one of the typical, cute Spanish towns in north western Spain. Since I was ahead of schedule I decided to stay an extra day there and found a little hotel on the edge of town. I explored the city and then discovered that I was extremely lucky to have decided to stay there. I was having dinner on the edge of a large plaza when someone stopped in the middle of the plaza and installed a sound system. I had seen a stage on the edge of the plaza, but no activity. However that changed rapidly. Within an hour there were hundreds of chairs set up and people came from all sides. It turned into a huge dance festival that entire evening. What a shame that I did not have my camera with me! Beautiful colorful, traditional clothing was worn by the participants, exciting Spanish music with dances on the stage all evening. How lucky I was! After Astorga the terrain stared to change and become much more interesting, more hills, more greenery, more small scale farming, more small villages you walked through, what a difference with the days before Leon. The following nights I stayed in some of the nicest little cities Spain has to offer: Rabanal, Molinaseca, Villagranca, Triacatela and finally Sarria. Again, the terrain changed more and more, higher and higher hills, more different green colors, steep terrain, difficult hiking through villages where the cows moved through the streets with the resulting slippery surfaces. I walked into one of the nicest provinces: Galicia, absolutely gorgeous views down valleys and across hills high enough to be called mountains by some people. Until the last day before Sarria the weather was great. Only the last day I got soaking wet after 6 hours of rain and more rain. Sometimes the food is good, sometimes not so much. Last night I had a terrific pizza in an Italian restaurant, a few nights earlier I looked forward to pizza which was advertised on a large sign out front of the restaurant, but it turned out to be a ‘Costo’ frozen pizza warmed up in the microwave, what a disappointment. 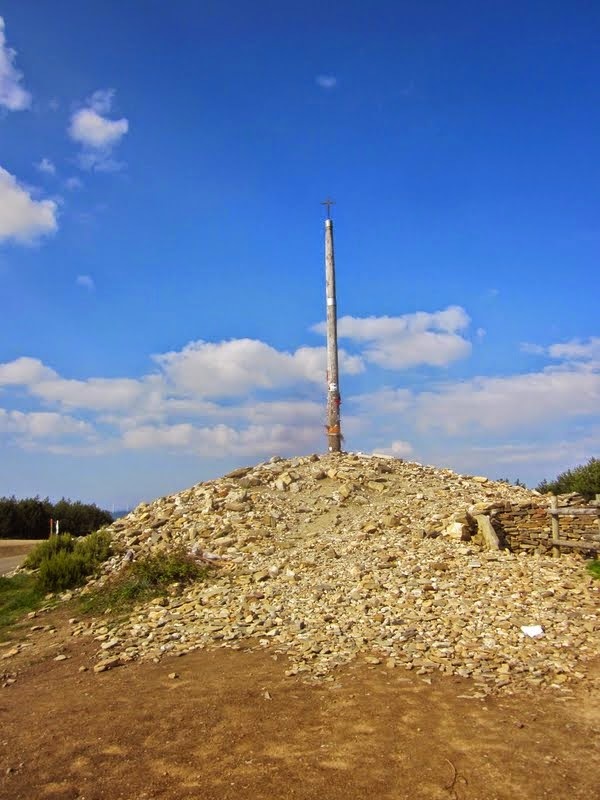 A few days ago I walked up to one of the highest points on the camino: La Cruz de Ferra, it is a large pile of rocks that is created by the pilgrims. You are supposed to bring a stone from your home area and leave it on the top of this mountain. It was started around the year 1000 by a monk called Gaucelmo. He erected a cross on the site that was an original altar built by the Romans for their god Mercury. Since the 11th century every pilgrims and there have been many millions have brought a stone to put on the pile. Of course it has grown into a large pile over the centuries. Several months ago my grandson Nico gave me a rock he picked up from the beach when we were out walking one day. I told him that I would take that rock with me to Spain to put in a special place. And carry it I did. I did put it on the pile of rocks and made my wish as you may when you bring a rock. Unfortunately that day my ipad refused to take pictures and I could not sent him a picture of my putting it on there. However with my other camera I did did pictures and as soon as I get home I can show him. So now I have landed in Sarria. I found a cheap hostel where I can stay this week, found a bookstore with a few English language books and will be just fine holed up for awhile. 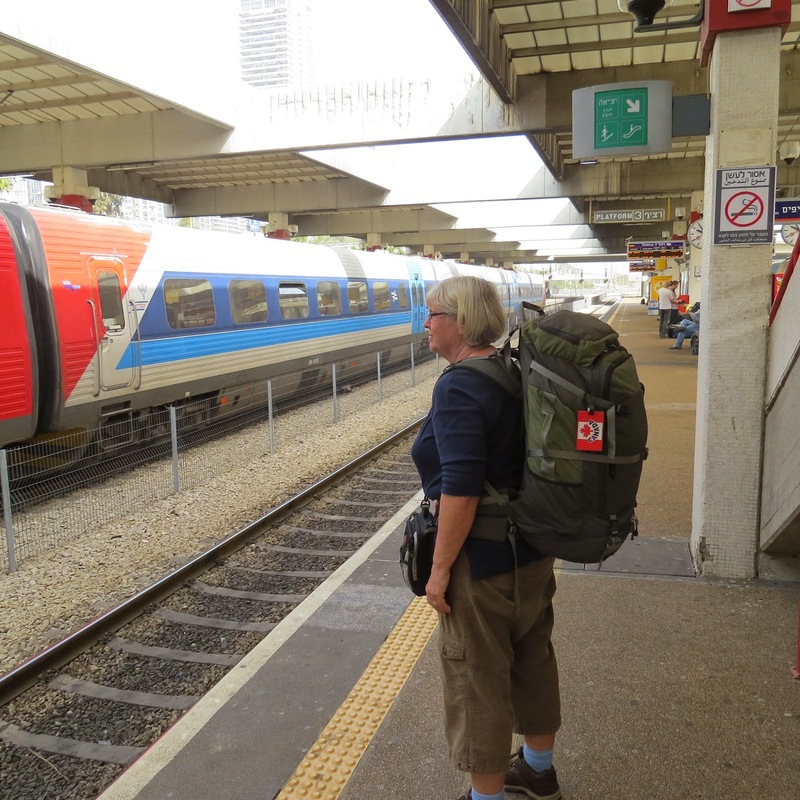 I”ll check and see if I can catch a bus to Santiago to pick up Margriet from the airport and then we’ll take the bus back to Sarria to walk the last 110 km of the camino together. I can’t wait to see her after 5 weeks on my own. BUEN CAMINO that is what every pilgrim wishes every other pilgrim when we meet on the trail or passing a pilgrim resting somewhere. It sounds like ‘BON CAMINO’ and is usually the second greeting after ‘Ola!’. Hola is used to greet any person, pilgrim or not, and is primarily used in the afternoon because morning greetings are usually Buenos Dias (good day) which is often shortened to Dias or even Das. Even if you know little or no Spanish, as I do, these words you’ll learn pretty quickly just walking the camino. Other than that it depends on how much you want to learn or how much you rely on the Spaniards to speak English. I found in 1999 that people under 25-30 would usually speak some English because they apparently learn it in school. Today that age group has grown to 40-45 and it makes communicating a little easier. In the beginning of the hike you can figure out some of the words on a menu, later on, after having seen some English language menus you even start to recognize the Spanish words for certain dishes. Although a few times I have been surprised with what they put in front of me. Not to worry, usually you are hungry enough to be brave and try it and most of the time it is a pleasant surprise. The town I am in right now, Sarria, is the starting point of the camino for about 25% of the people who walk it. It shows because the town at times looks like it is overrun by people who seem unprepared for the 100 km hike. They either have huge packs, or no packs and use a taxi or ‘porter’ service to have their luggage moved to the next place. I met a few of them and in some cases I wonder if they will make it beyond the second stage, however I hope I am wrong because some are spending a lot of money to get here and to stay in expensive hotels along the way. Four elderly people from Australia admitted that they rarely had walked more than 15 km a day and never for a whole week every day. You just hope that they don’t get themselves into trouble. A friend with whom I walked at the start of the camino for a few days, arrives in Santiago today or tomorrow and reported that after Sarria de trail got a whole lot busier and she was seeing a lot of white legs walking ahead and behind her. Anyway, I’ll find out for myself in a few days. Tuesday we hope to start tackling the last 110 km. “How hard can a week be?” I thought. 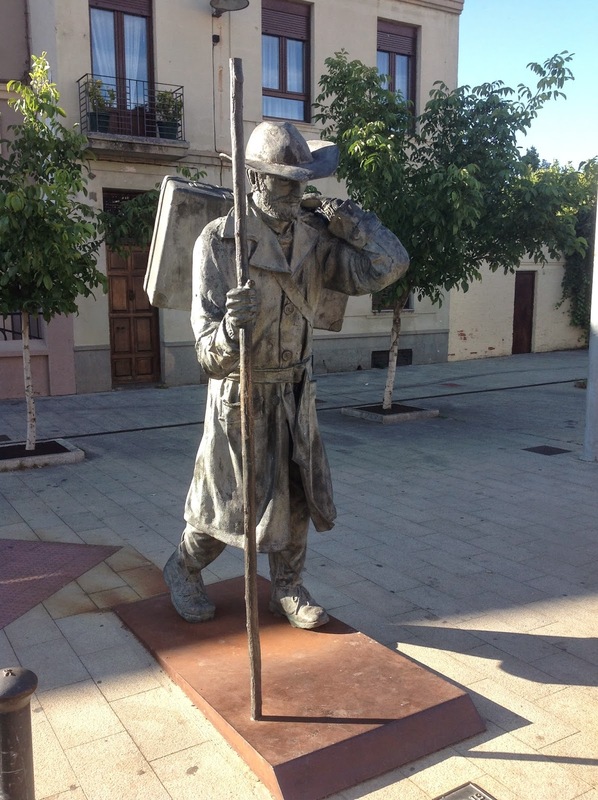 Kees had talked about walking the Camino again ever since he did it 15 years ago. Five weeks of walking with a heavy backpack, day in, day out, were not exactly my cup of tea but I thought it would be fun to experience the last week of reaching Santiago together. I wanted to encourage him to do it. “Go!” I said.I had good hiking shoes and walked on them much at home, into town and whenever I went for a hike. I took the bare minimum so my pack wasn’t terribly heavy. But oh.. The slogging wasn’t easy. 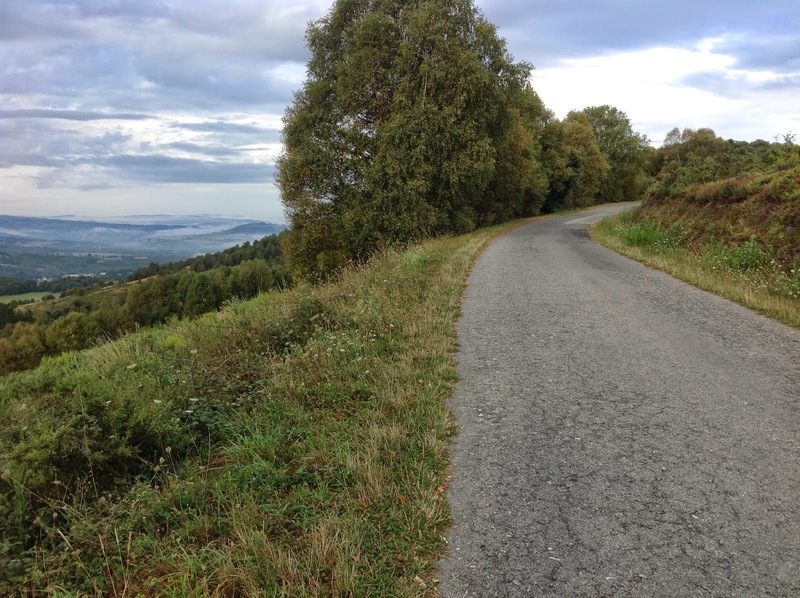 Up hill, along muddy paths… I did 112 Km in a week. Compare that to the 720 Kees completed. And he faced real mountain ranges, and heat, lonely plateaus and cities. I just trudged through tiny villages and cool forests. A couple of days of rain but, in the end, also blue sky and sunshine.It is always interesting to me to notice tiny little cultural differences in countries. Nothing earth shattering but interesting nonetheless. Here in Spain that includes pillows. In a double bed, there is one long pillow for two people. Why not two smaller ones so that you can each stomp and pummel and turn your pillow. But one long skinny one to share…The menu de diaz, day menu, for hikers along the Camino, is also interesting. For 8 or 10 euros you get to choose from one appetizer: soup, salad (a very large mixed salad) or a large plate of pasta. After this comes the main plate: usually very pale fries, a very flat piece of pork or chicken or a piece of beef. No vegetables. Dessert is cake, pudding or icecream. The meal also comes with large, dry chunks of bread. No butter. And a glass of wine or water. Along the Camino, the specialty is Cake de Santiago: a fairly dry but tasty almond cake. I find it interesting that we can’t get bacon and eggs for breakfast but for every other meal. Lunch is often bacon and eggs with bread. And hamburgers have a big fried egg on top of the meat. Most meat dinners also come with fried eggs. But breakfast is mostly just bread and jam or a croissant.I was surprised to learn that a ‘tortilla’ is not at all the tortilla we know in North America! It’s not a rolled up flat tortilla shell with meat and cheese etc. inside. A tortilla here is an omelette. A tortilla quaso is a wonderful, soft cheese omelette.The villages through which we pass are very tiny, sometimes not more than 2or 3 houses and a barn. Many citizens living along the Camino have realized the pot of gold in their backyard. They have put plastic chairs out and offer coffee or lunch. They must make a bundle because the stream of pilgrims seems endless. 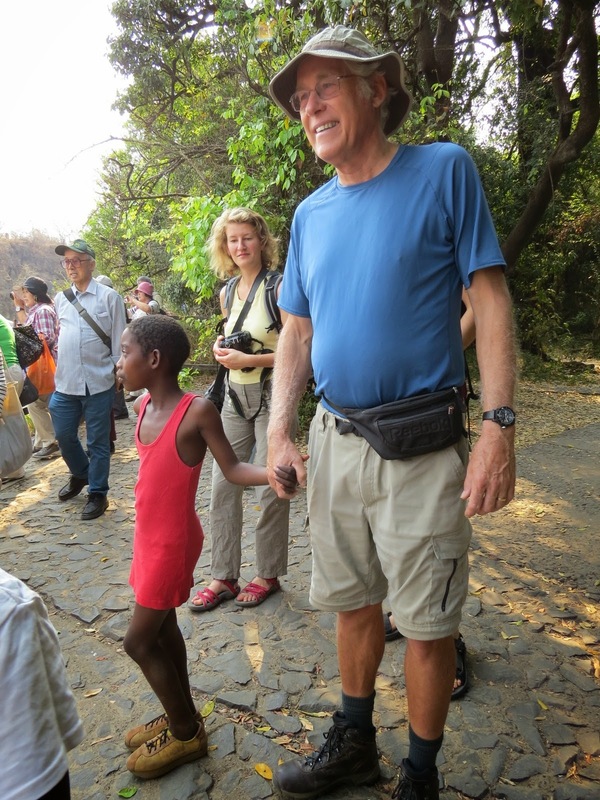 People from all over the world hobble along, carrying packs and nursing their feet. Many have joined the Camino in Sarria, like I did. But the real ones come from much farther away – like Kees who passed the 700 KM mark today. There’s no way I would do that…We’re picking up many Spanish words as we go and can order meals, ask for a room, etc.I enjoy seeing the many farm yards as we pass. Flowers like fuchias, hydrangias, sunflowers. And vegetables like zucchini, pumpkins, Brussel sprouts, kale, carrots and potatoes are in abundance. We pass under grape vines in small villages and hear roosters crowing. Once in a while a farmer leads his cows down the road or we let a flock of sheep pass. We do a lot of slip sliding on the cobblestones…And then, 6 days later, we arrived in Santiago. Suddenly there were major highways and many houses. We walked through the outskirts into the old heart of the city. More and more pilgrims congregated here but it was not the stream of people we had expected. Blue sky and sunshine made for a glorious last day. We reach the Cathedral – an emotional moment. We did it. Tomorrow we pick up our certificates as we show the many stamps we collected along the way in our pilgrims’ passports. For now, we will drink a glass of wine to our accomplishments. I will nurse my two blisters and then?… We will have to come up with the next plan! To Walk the Camino or Not to Walk the Camino? When I started the Camino in early August I wondered if I would enjoy it this second time around. Now that I have completed it a week ago and have had time to reflect I would say an absolutely YES. It was very different this time around, many more hikers, probably 5 times as many, but also much more infrastructure to support the pilgrims. The last week of the hike it was so busy that at times I wondered if I was walking down the Camino or the Kalverstraat in downtown Amsterdam or Robson street in Vancouver. At times, that last week, I wondered if the entire world had descended on the Camino. However overall it was the same experience I had the first time around, one of solitude, sometimes loneliness, but one of simplicity and peacefulness. At times I was very tired, but satisfied that I had completed another section. Sometimes there was boredom because the terrain was not very interesting. Other times it was awe inspiring because the skies or the landscape were so fantastic. Sometimes it was the people you met, or the fact that you did not talk to a soul for 12 hours. It is so different from what we are used in daily life, that it was fun most of the time and boring at other times; always different and exiting and challenging. Hope to see you on a trail somewhere!